“It’s impossible to imagine how a musical could be more epic” is one of the taglines of this new hybrid of rock musical and serious literary references which has charged into the Arts Theatre until 26 August. The House of Rose (not York or Lancaster, you’ll notice, this is some kind of medieval house where another kingdom is just around the corner) is ruled by a King and Queen in their dotage, with their heir, Prince Gawain, and daughter, Princess Hannah. They also have a ‘Lady’ Isobel who seems to have joined their family somehow, and one Horatio who I swear said at one point he was an illegitimate son of the House, but he is the devoted servant of Gawain even though they love the same woman. In the meanwhile the other Knights include the wet but decent Lord Hugo and the fiery Lord Palamon, and both want the Princess, although the battle and tension between them that should arise from this psychological conflict is not really explored, and is weakly resolved in Act Two. Then there’s John the messenger boy, who acts as narrator/chorus at various points, and a couple of servant girls who have potential in their characters but remain undeveloped. This show tries to shoehorn in some classic rock songs as the plot progresses, but they are forced in with such ineptitude that the audience doesn’t know whether they should be laughing or not (one example of a character saying “would you dance, if I asked you to dance” to lead into the song “Hero”), and by Act Two there is a whole run of questionable creative choices starting with “He Ain’t Heavy, He’s My Brother” over the body of one of the fallen Knights and ending with a bizarre staging of “Total Eclipse of the Heart”. The singers are very impressive though, with Andy Moss as Gawain, Oliver Savile as Hugo, Chris Cowley as Palamon, Matt Thorpe (excellent rock vocals) as Horatio and Ruben Van Keer as John as the brave and testosterone-heavy Knights, while the ladies (Katie Birtill, Rebekah Lowings and Bleu Woodward) do a spirited version of “Holding Out For a Hero” in Act One. Adam Pearce as the King also surprises with the heart-rending lament from the opera “King Arthur” in Act Two, but this whole sequence sticks out like a sore thumb and simply confuses, as did the reprise of “Bed of Roses” from the royal couple in their garden. I would have liked more numbers which treated the plot with folk material (“Turn Turn Turn” did well), and with more tightly choreographed pieces – there’s one in each Act, which do have the sense of epic fire we were promised. Also follow through on those relationships and tangled loyalties which would put meat on the show’s bare bones and give these characters much needed emotional investment for an audience – it is to the credit of the actors that we can engage now and then with their dilemmas, but it is frustrating to have to fill in the blanks ourselves. Ultimately this feels like a show still in workshop mode which doesn’t know whether it wants to include rock songs ironically (like “Rock of Ages”), or whether to present the plot as musical comedy (like “Spamalot”). Quoting – or rather misquoting – Shakespeare and a whole host of other luminaries to make up for a weak book is not enough, and this needs a lot more thought to really succeed. My thanks to Premier PR for arranging the tickets to Knights of the Rose. Knights of the Rose will appear during this year’s West End Live, 16-17 June 2018. It will star Andy Moss as Gawain. With rich interwoven literature from Marlowe, Shakespeare and Chaucer mixed with legendary classic rock music; Knights of the Rose is a glorious fusion of popular culture, evocative of ‘Game of Thrones’ and ‘Bat out of Hell’. This high-voltage musical of Shakespearean proportions charges its way into the heart of London on 29th June, for 9 weeks only. Creator, Jennifer Marsden, lives in West Sussex with her husband, Tim, and has three grown up children. She is a qualified Barrister and has always had a keen interest in theatre. Jenny began writing over eight years ago and is a member of Mercury Musical Developments, Musical Theatre Network, and the Inner Temple Inn of Court. Directing and Choreography credits include, Thoroughly Modern Mille (UK Tour), Summer Holiday (UK Tour), American Idiot (West End and UK Tour, winner of Best New Musical in the West End Broadway World Awards, Best Director and Best Choreographer nomination What’s On Stage Awards), Footloose (West End and UK Tour), Vanities (Trafalgar Studios, West End), Guys and Dolls, The Drowsy Chaperone, and Into The Woods (The Gatehouse). Racky’s choreography credits include, Flight (Symphony of the Seas), Columbus (Harmony of the Seas), Respect La Diva (Garrick Theatre, West End), Jekyll and Hyde (UK Tour), Josephine Baker (The Beckett Theatre, New York), Cougar (The Belgrade, Coventry), Lost Boy (Liverpool Playhouse), West End Bares (Jerry Mitchell/MAD Trust), Denise Pearson – The Jackson’s World Tour (UK Arena Tour), Forever Plaid (UK & International Tour), Bare – The Rock Musical (Best Choreography nomination Broadway World), Bernarda Alba, and Once Upon A Mattress (Best Choreography nomination Off West End Awards, The Union Theatre), The 48hour Musicals – The Boy Friend (Her Majesty’s Theatre), Crazy For You, and Me & My Girl (London Palladium). Born in Spain, London based Diego Pitarch studied architecture and Interior Design in Valencia, Barcelona and at the E.S.A.G in Paris, where he obtained an award for Scenography. In 2001 he completed his MA in Theatre Design at the Slade School of Art in London. His design for Katya Kabanova placed him amongst the finalists for the Linbury Prize. Since then Diego has created more than 100 designs for plays, musicals, ballets and operas for renowned theatres and producers worldwide. Successes include Sunset Boulevard in London’s West End, Spend, Spend, Spend directed by Craig Revel-Horwood, which won a TMA award for Best Musical in 2009, the 2011 European tour of The Who’s Tommy, the 2013 UK and Ireland tour of Fiddler on the Roof starring Paul Michael Glaser as well as the 2017 touring production of The Addams Family and Crazy for You. In 2015 The production of 1984 designed for the Altes Schauspielhaus in Stuttgart was nominated for the prestigious Faust award. Just outside of the festive season a trip to see a retelling of the Dickens classic was in order, although when I say ‘classic’ I was amused to hear one person behind me having the whole story explained to them before the show started. 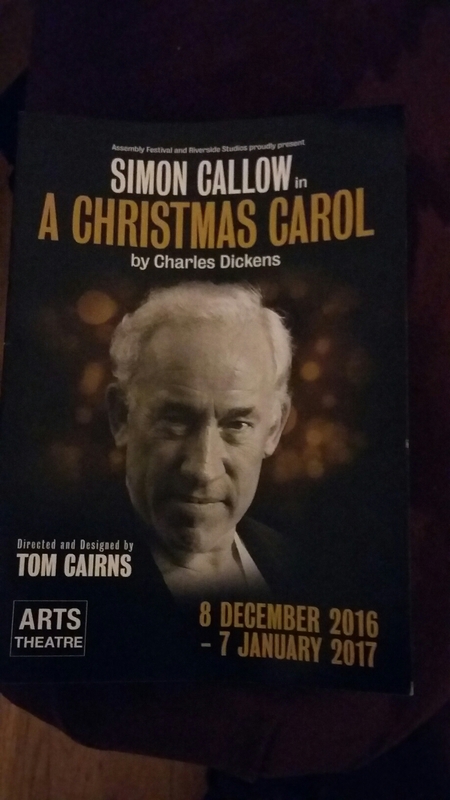 A one-man show, with Simon Callow in fine feckle as the grumpy and avericious old Scrooge, also essaying at various points the entire Cratchit family, the old Fezziwigs dancing, the jovial nephew Fred, the fat merchants, the spirits, and more. The story may be familiar but this version has humour and effective simplicity in its sets (a solitary candle, some chairs, clever lighting, a screen, and a handful of props and ideas from a snowy street to an open window). The power of suggestion comes from Callow’s gift as a storyteller, and this is a lovely festive piece of theatre.